You might have read that today M&S reported a £297m drop in profits for the first half of this financial year, with non-food sales particularly suffering (though admittedly improving somewhat towards the end of the period). Mark Bolland is working on supply logistics, merchandise design and technology (including thousands of iPads) as the solution to these problems. There’s also, of course, the oft-cited problem of the M&S bust of the 1990s – over-diversification, especially of brands – which Mark Bolland is ploughing an awful lot of time and effort into repeating for reasons that frankly baffle me. The store has broken signs, patched up floors and fitments, the whole works. Note that these are not front-line problems – these are problems caused by poor quality, poorly designed store fittings. This despite going through Mark Bolland’s slightly half-hearted £600m store re-invigoration programme. 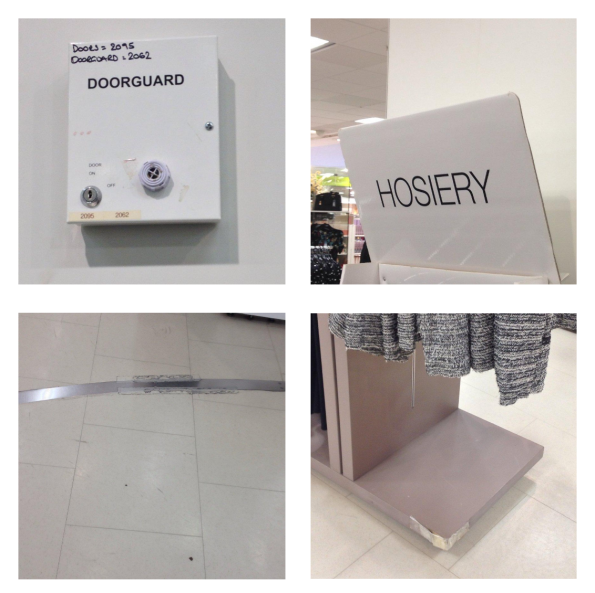 At heart, M&S is a premium retailer charging premium prices, which needs a premium retail environment – not shoddy broken fitments and badly scratched floors. Clearly, the estate isn’t M&S’s biggest problem, but I think it needs further consideration. But then, when you’ve spent £2.6bn on refurbishing the estate in just eight years – the better part of £1m per day – how can anyone possibly convince shareholders that further investment is warranted? Does it start to look like serious mishandling of the original investment? I don’t have the answers – and, frankly, I’m not convinced Mark Bolland does either. I’m obviously not party to the details, but I don’t think integrated multichannel retailing should be a massive priority – multichannel sales are increasing, but almost half of online orders are collected in store. In fact, if I were Mark Bolland, I would be trying desperately to retain in-store sales where service – M&S’s primary point of difference – is maximised. I’d be worried that one in five sales of men’s suits is online, not celebrating, as it puts customers a click away from, say, Brook Tavener, who compete strongly on price and quality, but without a bricks-and-mortar presence can’t hope to compete on service. Why isn’t M&S pushing it’s service? If it wants to embrace multichannel, why not do it in a novel way that makes the most of bricks, mortar and service? ASOS famously advertises it’s free returns service, inviting customers to order clothes in a number of sizes and return the ones that don’t fit. Why doesn’t M&S push a similar order-a-range-of-sizes-to-store service, which could be a strong competitor, losing the complexity for the customer of organising parcel drop-offs and pick-ups? It’s a service which is pretty much already available under the current system, but isn’t pushed at all online. Anyway, this is getting remarkably ranty for photo-a-day. I do hope you’ll forgive me! I’ll be back to normal service tomorrow, I’m sure! This 1,878th post was filed under: News and Comment, Photo-a-day 2012, Retail. Comment posted at 23:01 on 6th November 2012. 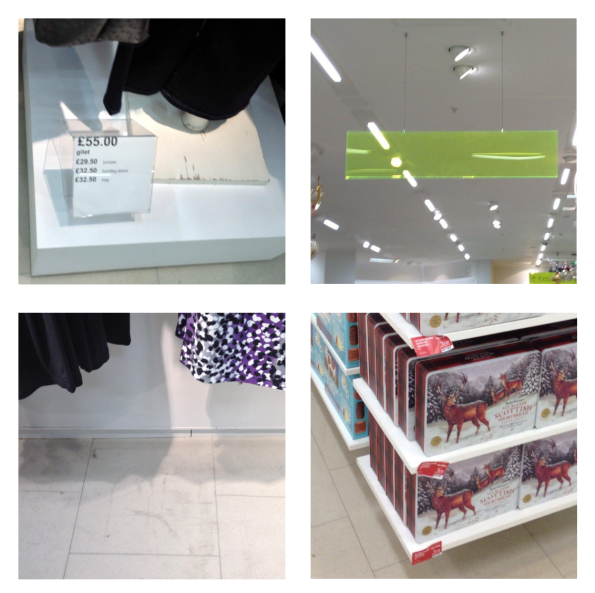 Marks and Sparks ‘refurbished’ their flagship store in Glasgow in Argyle St some years ago and went from a classy directed carpeting system that led you through the store, to a classroom white tiles/Primark kind of effort that made everywhere look the same. I also think their problem is that they are trying to compete with the likes of Primark and are falling between two stools. People expect higher prices in M&S, but want quality in return. What they don’t expect is Primark quality with mid-range prices and that’s what they’re getting. I note that their food sales are doing absolutely fine, where they have maintained the quality of what they’re doing. Their Chicken Saag is not cheap compared with others, but I would not buy it anywhere else.